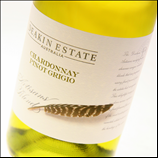 Artisan’s Blend Chardonnay Pinot Grigio from Deakin Estate. Vineyard – The grapes come from vines aged between five and fifteen years, trained on a two-wire vertical trellis and planted at 1,700 vines per hectare on sandy loam soils. They were harvested in early February. Winery – The juice was fermented in stainless steel at cool temperatures using aromatic yeast. The wine was bottled without oak or malolactic influence to ensure maximum freshness. Taste -This delicious blend combines the citrus and melon character of Chardonnay with savoury and pear notes from the Pinot Grigio. The palate is crisp yet generous, with a moreish finish. “The Deakin Estate property and its wines are named in honour of that visionary, Alfred Deakin.